The Ministry of Education as the responsible Ministry established Regional Directorates of Education for each region of Namibia. With the support of the Basic Education Programme a School Cluster System has been developed and successively introduced in all 13 regions of Namibia. Such a system structures an education region into a Regional Directorate, circuit education offices and school clusters or circuits, with a certain number of individual schools. The nation-wide introduction and the continuous support for the decentralised school cluster system led to a strengthening of decentralised education structures within the education system. This brought about the improvement of the internal efficiency of the education system regarding education management and service delivery at all regional levels. The focus was to improve the capacity of education officers to perform more efficiently within the decentralised structures at the level of the 13 Regional Councils as well as the Regional Education Offices and the Circuits of Education. In line with national objectives, the regional education officials are empowered to plan independently, to draw up regional budget plans and to implement them as well as to ascertain relevant data for planning within the framework of a national Education Management Information System (EMIS. They also need to cooperate closely with the Regional Councils to ensure that the education services and needs at a regional level are addressed. The Regional Directorate of Education for the Erongo Region is accommodated at the headquarters of the Erongo Regional Council in Swakopmund. In the ERC Annual Report for 2010/2011 it is stated that the positive academic results in Grade 10 and 12 of recent could directly be attributed to the joint and focused efforts by Regional Office Management, the Inspectorate, advisory staff as well as schools with the aim of enhancing the quality at schools in line with the National Standards. The assistance of education partners and the implementation of programmes such as the Rössing Outreach Programme, the Spring School, the award ceremony for teachers as well as an effective school cluster system, contributed tremendously to the successes achieved in the region. 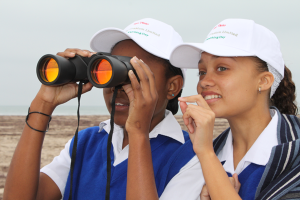 Schools in the Erongo Region are divided into three circuits each with an inspector. They attend to a total of 96 schools in the region. The school circuits are: Swakopmund, Walvis Bay and Omaruru.